Point being, you’re a painter. An insane painter, an alcoholic and abusive husband, a terrible father, a man possessed by demons. A modern-day Caravaggio or Goya. Bob Ross without his friendly afro. And all you want to do is paint, if the damn rats would just leave you alone. 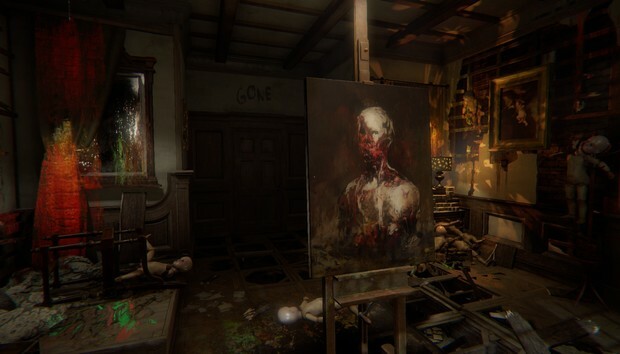 Layers of Fear is a horror game, in theory. Which brings us to today’s topic of discussion: Can a horror game can be successful if it never manages to scare? This discussion rarely arises, given that the horror genre—especially in games, though also somewhat in film—exists largely in the realm of shock value, in leaving us terrified to walk to the bathroom at night without flipping at least one light on. And if that’s the goal with Layers of Fear, then I’d say it fails. It’s not particularly scary. Oh, it tries. The game is full of horror genre cliches, from dolls to rats to creaking floorboards to thunderstorms to more dolls. The gimmick/hook is that you’re an insane painter, so the parade of tropes is occasionally broken by a room full of spilled paints or what have you, but by and large Layers of Fear is content to deal in well-trod imagery. And there’s a methodical repetition to its jump-scares, a disturbing proclivity for lowest-common-denominator YouTube fodder—the stuff of high-pitched screaming Let’s Plays. A light explodes! A lady screams in your face! A ceiling fan embeds itself in a wall! These are the most traditionally “scary” moments in Layers of Fear, and also the worst moments in large part thanks to an unwillingness to subvert your expectations. The game has a rhythm. If it’s been more than a minute since the game’s tried to nab you with a need-new-pants screamer, it’s guaranteed to happen soon. If it’s been more than five minutes...well, that never happens. The irony being that Layers of Fear is a game built on subverting expectations, in every way except for these stupid jump scares. So let’s say we can find merit in a horror game that’s not scary. You don’t have to agree, and if you don’t then I suggest you stop reading because Layers of Fear is “Not For You.” But for the sake of argument. When Layers of Fear isn’t trying to appeal to your baser instincts, it’s more along the lines of Antichamber or the virtual reality experiment Sightline: The Chair. You’ll find yourself in a room. Four walls, four doors. Behind you, the door you came in from. You open the door directly ahead. Bricks. There’s a brick wall behind this door and nothing else. The door to the left, also bricks. To the right, more bricks. Dead end. You open the door you came in from. Surprise! Bricks. You spin around and the other three doors have disappeared while your back was turned. And now the fourth door too. You’re in a featureless white room. Trapped. Or you walk through a door and find yourself walking back into the same room from a different doorway. Again, you leave. Again, the same room—except this time the furniture’s a bit more decrepit. You leave a third time, and now the room is in shambles...and all the objects are floating. Enter a room and you realize all the furniture is on the ceiling. You switch on the light, turn back around, and it’s been relocated to the floor. You can’t trust the space you’re in. It’s an unsettling idea, and I think doubly so to those who play a lot of games. We’re used to constructing mental maps, to remembering “This door leads back to the kitchen, which leads to the front hall, which leads to…” Now imagine the mansion in Resident Evil constantly rearranged itself, shuffling rooms like a deck of cards, creating impossible hallways and staircases that go two floors down but somehow leave you in an attic and rooms that change shape when you turn your back. The idea’s not exactly unique. Aside from the two games I already listed above, we can draw obvious parallels to both Lovecraft’s descriptions of non-Euclidean architecture and Mark Danielewski’s House of Leaves. But it’s expertly done here. Layers of Fear is a bit one-note, insofar as you start to understand and expect its tricks long before its three or four hour running time is up. In a perfect world where people didn’t complain about short games, it could’ve been edited down to probably half the length. Still, some scenes (particularly one involving a record player) are among the best the horror genre has to offer—in terms of artistry at least, if not raw terror. Suspense is an important tool, in horror. Suspense is what makes scares work. Five, ten, fifteen minutes of excruciating emptiness makes the eventual jump scare effective because we’re lulled into complacency. The pacing in Layers of Fear is numbing, with “scares” coming at you so often they quickly lose their potency. But approach Layers of Fear as low-key psychological horror like House of Leaves and I think there’s a lot more to be impressed by. The way rooms twist and turn in on each other like a hellish labyrinth, an impossible house full of impossible things—it’s unsettling. And it’s a technical marvel I’d like to see reproduced in other games, albeit with more restraint. Will net neutrality repeal kill the next YouTube? Under pressure: Is it now make or break for net neutrality?